Once you've started a plan, you can add tasks to list what needs to get done. Enter a task name in the box under To do, and then choose Add task. 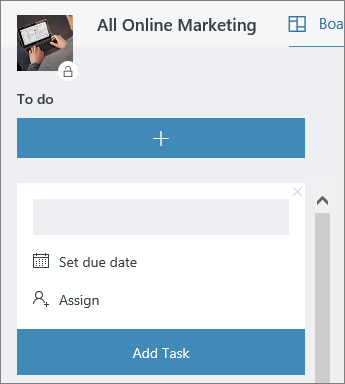 Tip: To list several tasks quickly, type a task name in the box under To do, press Enter, and then keep typing to add the next task. Don't see a box? 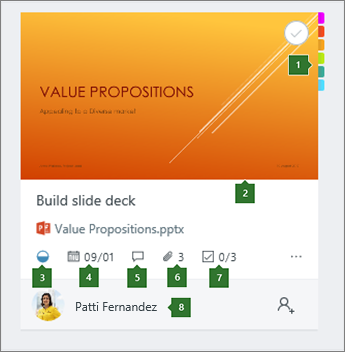 Click the plus sign (+) to show the box and add a task. Tasks can have a lot of different details in Planner. You can decide what you want to include or leave out, and how you want your tasks to appear on the Board. What you do next really depends on what you know about your work, and how you want to stay on top of things. Consider organizing your tasks into buckets and adding the people you'll be working with.